When you’re a big fan of silent films – including those in the horror and fantasy genres – you learn to expect the unexpected; so many little-known treasures are constantly being restored and made available to contemporary viewers. 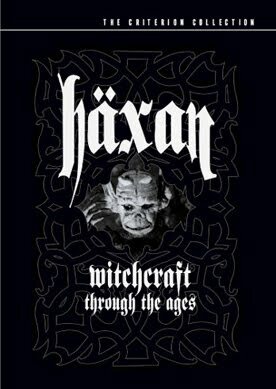 But Benjamin Christensen’s 1922 film Häxan (also known as Witchcraft Through the Ages, or simply The Witches) was a genuine surprise, one of the most enigmatic and unusual movies I’ve seen in a long time. It made me want to rush out and tell people to watch it, even if they aren’t particularly interested in silent films, or in the dark subject matter of this one. Apart from the obvious research and care that went into its making (the set design in particular is excellent), what makes Häxan so distinctive is its constantly changing tone – it shifts from an educational, documentary-style presentation to a fictional (but realist) narrative to outright fantasy, and I think this may reflect the dynamic personality of its writer-director. But at the same time, Christensen’s contribution to Häxan as an actor is a deliciously over-the-top performance as Satan. 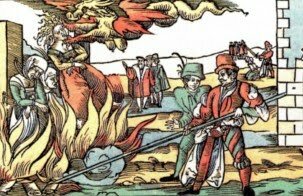 Unlike many later movie depictions (examples: Walter Huston in The Devil and Daniel Webster, Jack Nicholson in The Witches of Eastwick), there’s nothing smooth or mannered about this Devil. He’s pure satyr, repulsive to look at, bare-chested, pot-bellied and lumpy, impatiently knocking on boudoir doors and enticing young women into his hairy arms even as they lie next to their dozing husbands, or tempting nuns to desecrate statues of the infant Jesus. And he waggles his forked tongue better than Amitabh Bachchan playing Babban in RGV ki Aag. It’s almost as if Christensen is wryly saying that primitive beliefs in devilry were so compelling that they forced him to change the nature of his film, because the only way to present those beliefs was to dive headlong into fantasy. 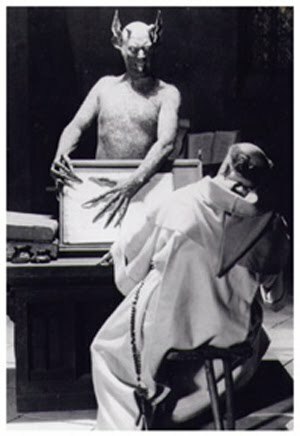 However, I suspect he also worked the Devil in because he wanted to have some fun playing him! 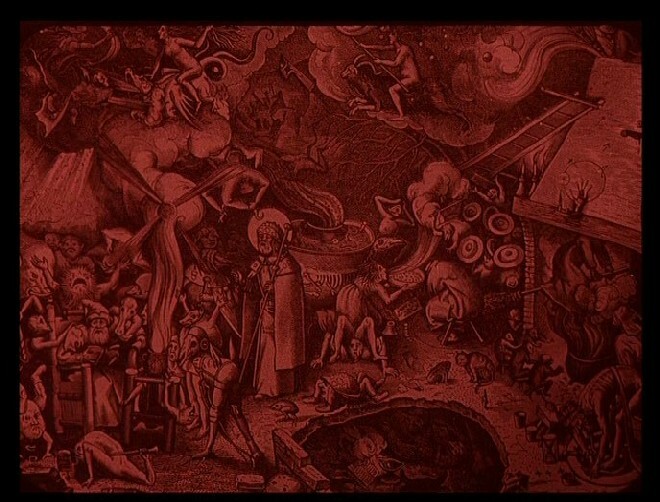 The first 10-15 minutes of Häxan are made up of stills, including wood-cut drawings taken from medieval books. 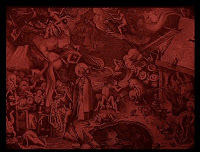 The film initially seems less concerned with witchcraft than with primitive beliefs in general: the notion that the earth was the centre of the universe, with an outer layer made up of fire, and the Almighty and his angels seated beyond; the Egyptian view of the world’s topography, with stars hanging down by cords from a sky made of iron; and finally, medieval notions of Hell, with pictures and mechanised depictions of demons energetically stoking flames beneath cauldrons. The narrative section – and the first shift in tone – begins with a scene set in the “underground home of a sorceress, 1488”, and then moves on to other little vignettes: a woman seeking a “love potion” with which to seduce a fat monk; the “reading” of a chunk of lead to determine if a patient is the victim of sorcery; wizened old women being branded witches because they were “ugly or deformed”; pretty young women being branded witches because they had an inappropriate effect on young monks; the use of varied torture techniques and instruments. 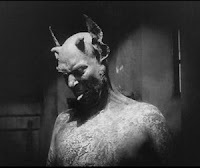 For all the potential sensationalism in this material (and there are many shocking or gruesome scenes) and despite the farcical portrayal of Satan, Häxan is ultimately a mature, dignified film. The prevailing tone is that of pity for the victims of medieval prejudice. One gets a very strong sense of how the powerful prey on the weak, often using religious authority as an excuse for the playing out of baser instincts - and of course it would be silly to believe that such exploitation doesn't take place in our own time. “Let’s not believe the Devil exists solely in the past,” says a title towards the end of the film, “Isn’t superstition still rampant among us?” (A clever dissolve connects a medieval “witch” handing out love potions with modern-day card-readers and crystal-ball readers selling prophecies to their customers.) 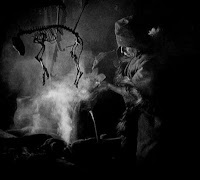 At a time when many directors were using films either as overt propaganda or to confirm existing prejudices (as in D W Griffith’s landmark The Birth of a Nation, which cast the Ku Klux Klan as heroes), Häxan is an example of a movie that managed to be serious and enlightening even as it played about with the possibilities of film narrative. Enjoyed reading the review and am suitably tempted to watch the movie! 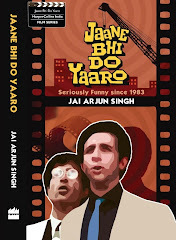 Lovely piece (as usual), Jai, thanks!